We document novel shifts in the lead-lag properties of the US business cycle since the mid-1980s that have gone unnoticed in contemporary research. Specifically, (i) the well-known inverted-leading-indicator-property of real interest rates has completely vanished; (ii) labour productivity switched from leading positively to lagging negatively over the cycle; (iii) Labour input measures shifted from lagging labour productivity pos- itively to leading negatively; (iv) Unemployment rate shifted from lagging productivity negatively to leading positively. Many contemporary business cycle models produce counterfactual cross-correlations. Determining the underlying sources of these shifts in the lead-lag properties is challenging yet a promising direction for future research. Brault, Joshua, & Khan, H.U. (2018). 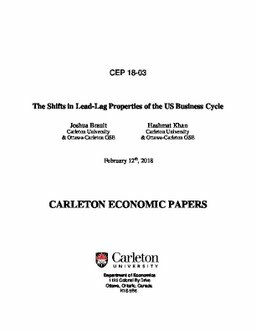 The Shifts in Lead-Lag Properties of the US Business Cycle (No. CEP 18-03). Carleton Economic Papers (CEP). Department of Economics.